1990 – Headache For Tomorrow – German Tour Poster. 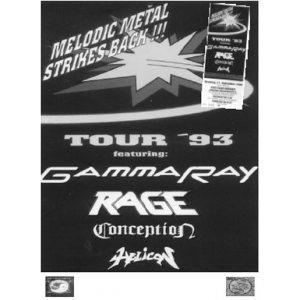 2/9-17/9 – Tour 1990 – Special Guests Risk. 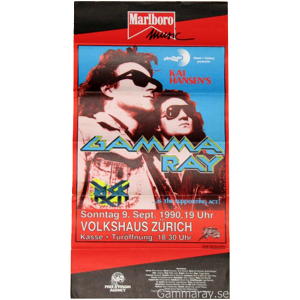 1990 – Tour Poster – Volkshaus Zurich. 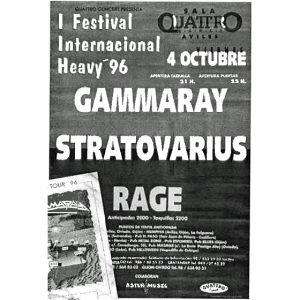 Sunday 9/9 – 1990 – RISK ir the supporting act!. 1991 – Sigh No More Tour Poster. 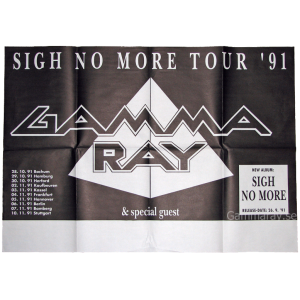 Sigh No More Tour 1991 – 28/10-10/11. 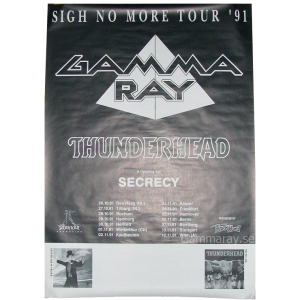 Sigh No More Tour 1991 – 26/10-12/11 – Thunderhead & Secrecy supporting. 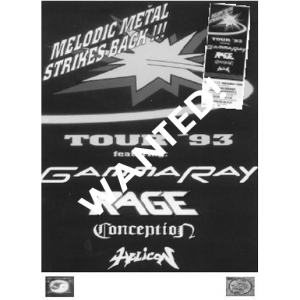 WANTED: 1993 – Melodic Metal Strikes Back!!! 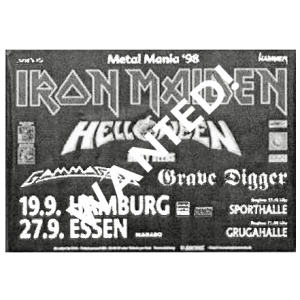 – Tour 93 Poster. Tour 93. 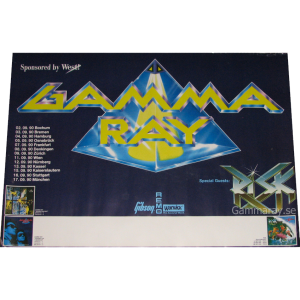 Featuring: Gamma Ray, Rage, Conception & Helicon. 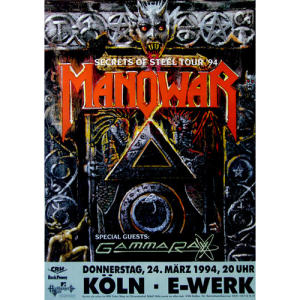 WANTED: 1994 – Secrets Of Steel Tour ´94 – Tour Poster. 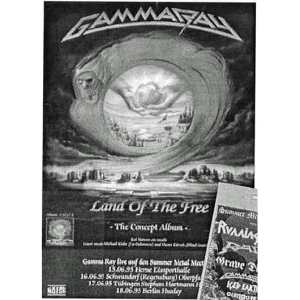 Manowar tour 94 – Special Guests: Gamma Ray. 24/3 – Köln. 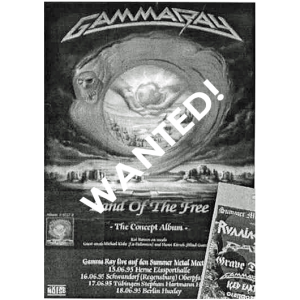 WANTED: 1995 – Land Of The Free – Summer Metal Meetings Tour. 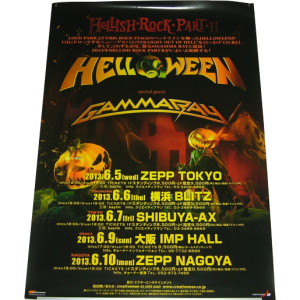 12/6 – 18/6 Summer Metal Meetings Tour Poster. 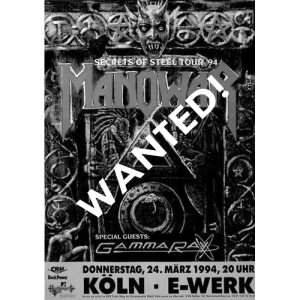 WANTED: 1995 – Land Of The Free – Tour 95. 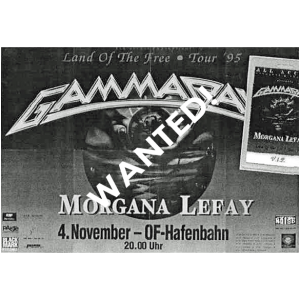 4/11 – 95 Poster, with Morgana Lefay. 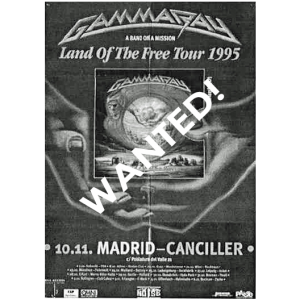 WANTED: 1995 – Land Of The Free – Tour 95 – Spain. 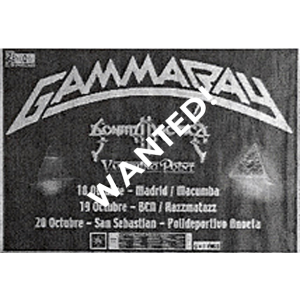 A Band On A Mission – 10/11 – 95, Madrid (Canceled) Poster. 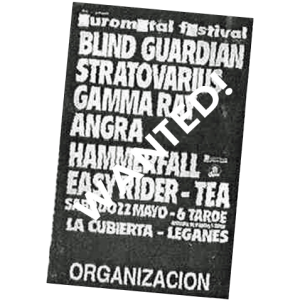 WANTED: 1996 – Land Of The Free – Spain Tour 96. 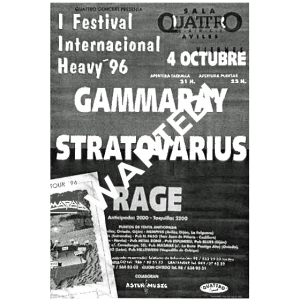 Heavy 96 – 4/10 Poster – Gamma Ray, Stratovarius & Rage – Spain. 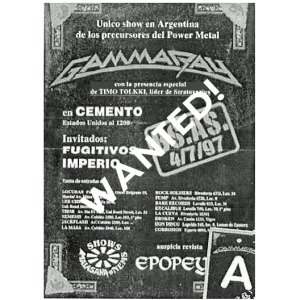 WANTED: 1997 – Somewhere Out In Space – Argentina Tour Poster. 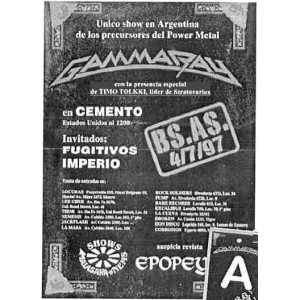 Buenos Aires 4/7 – 1997. Sao Paulo 12/7 – 1997. 1997 – Somewhere Out In Space – Tour 97 – Poster. 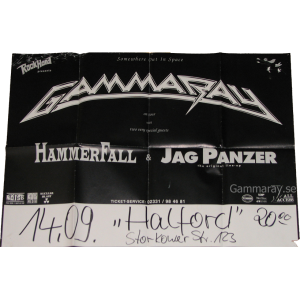 Somewhere Out In Space on tour with two very special guests – Hammerfall & Jag Panzer – 14/9-1997 Halford. 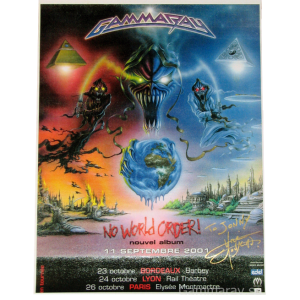 WANTED: 1998 – Metal Mania 98 Tour Poster. 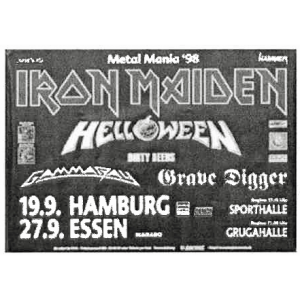 19/9 & 27/9 – with Iron Maiden, Helloween, Gamma Ray & Grave Digger. 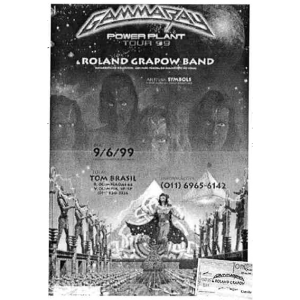 1999 – Powerplant Tour 99 – Poster. 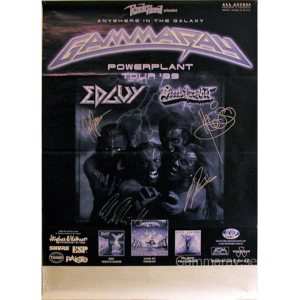 Anywhere in the Galaxy PowerPlant Tour 99 with Edguy & Steel Prophet. Signed by Kai, Dirk, Henjo & Dan. 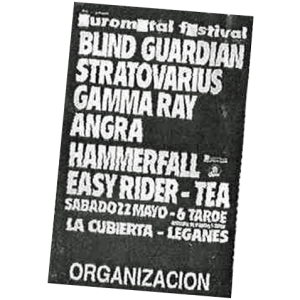 WANTED: 1999 – Euro Metal Festival – Spain – Poster. 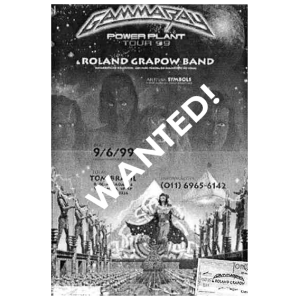 WANTED: 1999 – PowerPlant French Tour – Poster. 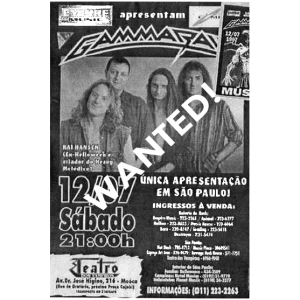 WANTED: 1999 – PowerPlant South American Tour 99 – Poster. 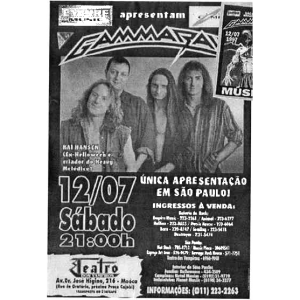 Sao Paulo 9/6-99. With Roland Grapow Band. 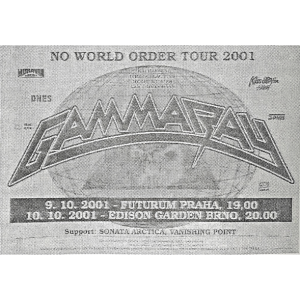 2001 – No Order World Tour 2001 – Poster. Special Guests Sonata Arctica & Vanishing Point. 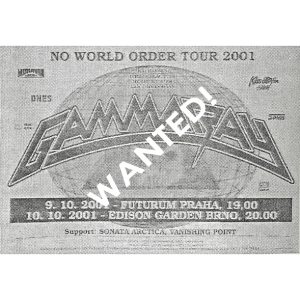 WANTED: 2001 – No World Order Tour 2001 – Czech – Poster. 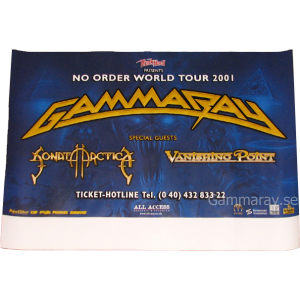 WANTED: 2001 – No World Order Tour 2001 – Spain – Poster. 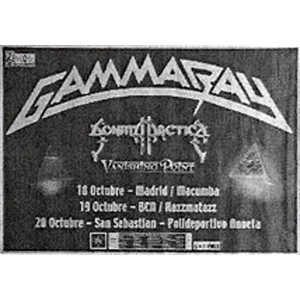 18-20 October 2001 – Supporting Sonata Arctica & Vanishing Point. 2001 – No World Order France Tour – Picture. 23-26/10 – 2001. Poster signed by Herve Monjeaud to me. 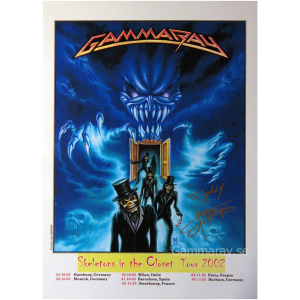 2002 – Skeletons In The Closet – Tour 2002 – Poster. Special guest Paragon. Signed by Kai, Dirk, Henjo & Dan. WANTED: 2002 – Skeletons In The Closet Tour – Spain – Poster. 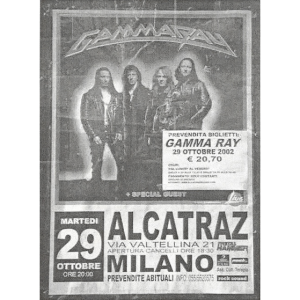 29 October 2002 – Milano. 2002 – Skeletons In The Closet Tour 02 – Picture. 24/10 – 4/11 – 2002. Poster signed by Herve Monjeaud to me. 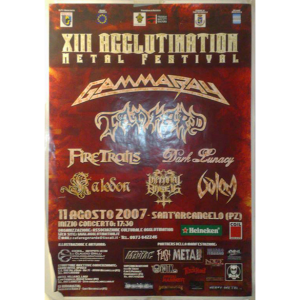 2003 – Latin American Tour 2003 – Poster. 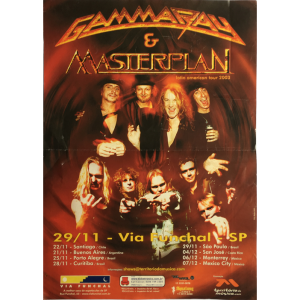 Gamma Ray & Masterplan Latin American Tour 2003 Tour Poster. 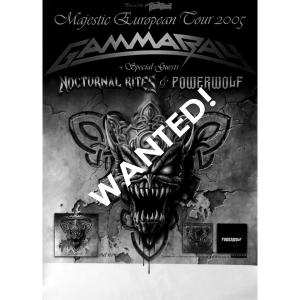 WANTED: 2005 – Majestic European Tour Poster. With Nocturnal Rites & Powerwolf. 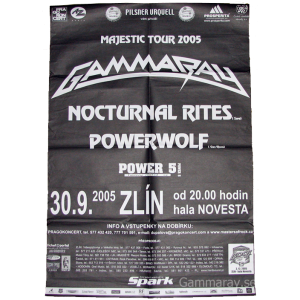 2005 – Majestic Tour – Polen – Poster. Zlin Polen – 30/09 – 2005. With Nocturnal Rites, PowerWolf & Power 5. 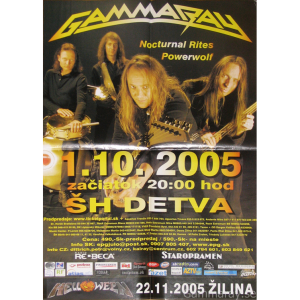 2005 – Majestic Tour – Slovakia – Poster. 1/10 – 2005. With Nocturnal Rites & PowerWolf. 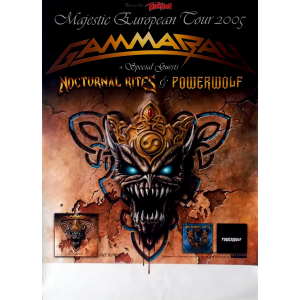 2006 – Majestic Scandinavian – Tour 06 Poster. 14/1-20/1 – 2006. Signed by Kai, Dirk, Henjo & Dan. 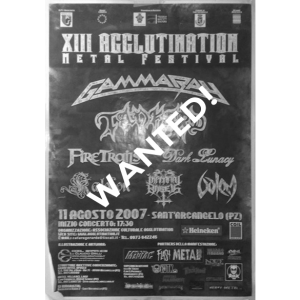 WANTED: 2007 – XIII Agglutination Metal Festival Poster. 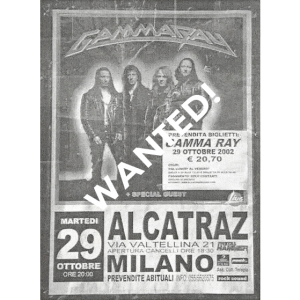 11 August 2007 – Tour Poster. 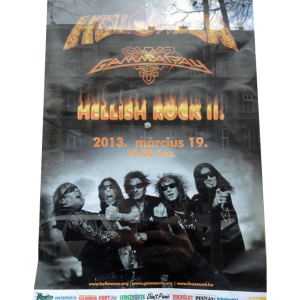 2007 – Hellish Rock Tour 07 – Slovakia Tour – Poster. 18-19/12 – 2007. Signed by Kai, Dirk, Henjo & Sascha Gerstner. 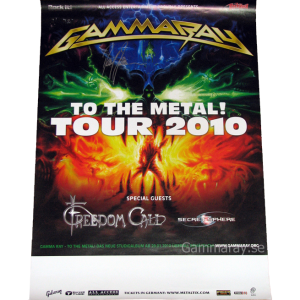 2010 – To The Metal Tour 2010 – Poster. Special Guests Freedom Call & Secret Sphere. 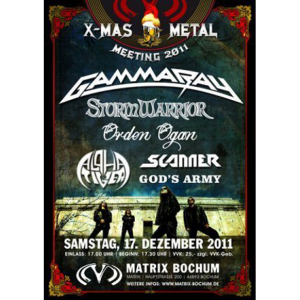 2010 – To The Metal Tour – Stockholm Poster. 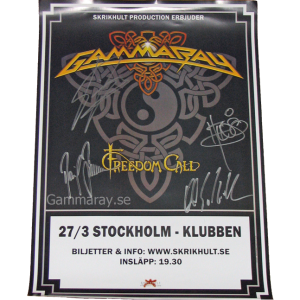 27/3 – 2010 with Freedom Call – Stockholm, Sweden. Signed by Kai, Dirk, Henjo & Dan. 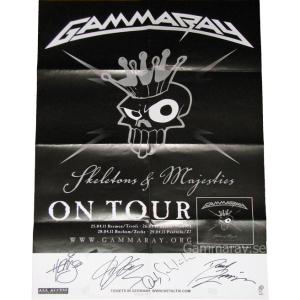 2011 – Skeletons and Majesties On Tour 2011 – Poster. 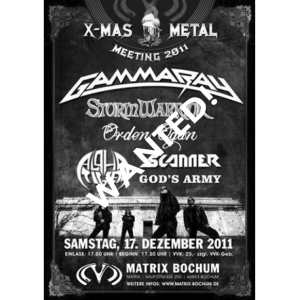 WANTED: 2011 – X-mas Metal Meeting 2011 Poster. 17 December 2011. August 2007 Tour. 2011 – Winter Masters of Rock – Tour Poster – Czech Republic. 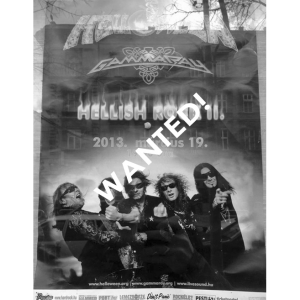 WANTED: 2013 – Hellish Rock Tour Part 2 Hungary – Tour Poster. 19/3 – 2013 – Budapest. 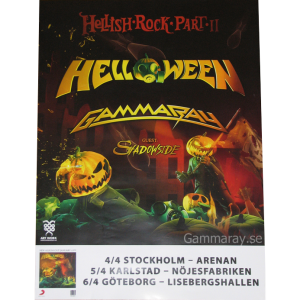 2013 – Hellish Rock Tour Part 2 – Sweden Tour – Poster. 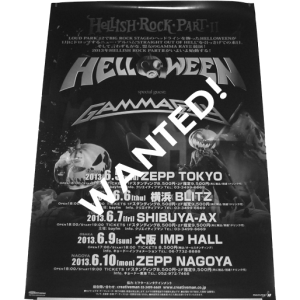 WANTED: 2013 – Hellish Rock Tour Part 2 – Japan Tour Poster. 5/6 – 10/6 – Japan Tour.